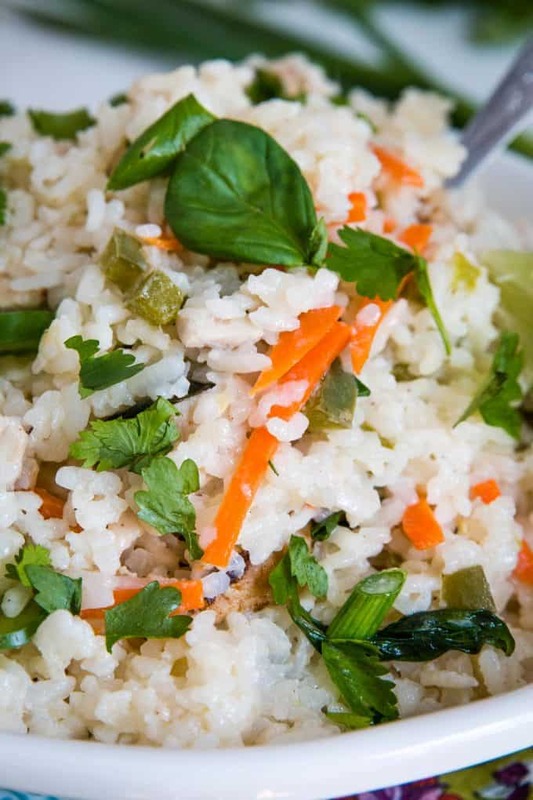 This one pot spicy Thai rice recipe is easy to make and full of flavor. Perfect as a side dish or a full meal. Add meat if you like! This post has been sponsored by RiceSelect. All options and my love for their products are my own. I happen to know a few Thai chefs and I’m always surprised by all of the flavors of their dishes. Spicy, sweet, sour, salty and bitter – they manage to make everything work together. So I did the same. Spiciness comes from jalapenos, sweetness comes from coconut milk and carrots. Limes add a little sour and bitterness and the salty flavors come from the fish sauce. A little bit of everything! I start cooking the rice while I’m chopping up all of the veggies. To make things interesting I used RiceSelect arborio rice. 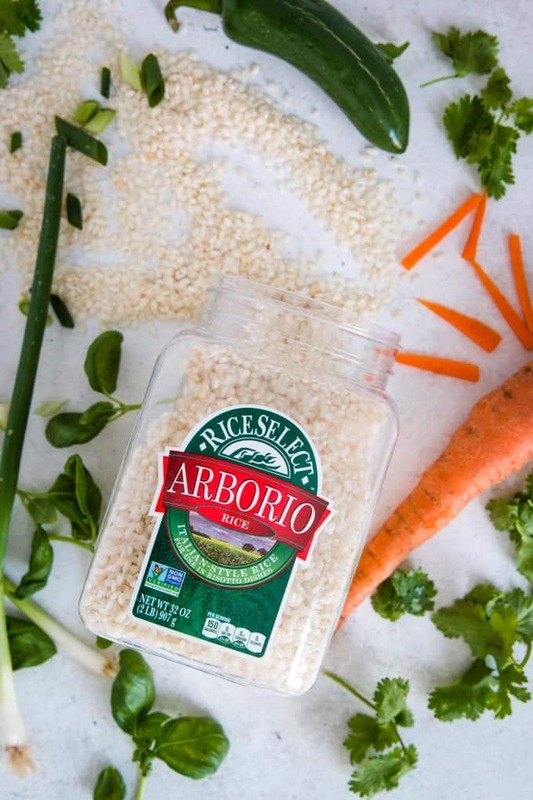 Arborio rice is usually used to make risotto or rice pudding – it is what makes both so creamy! It goes well with so many flavors making it perfect for Thai-inspired dishes. 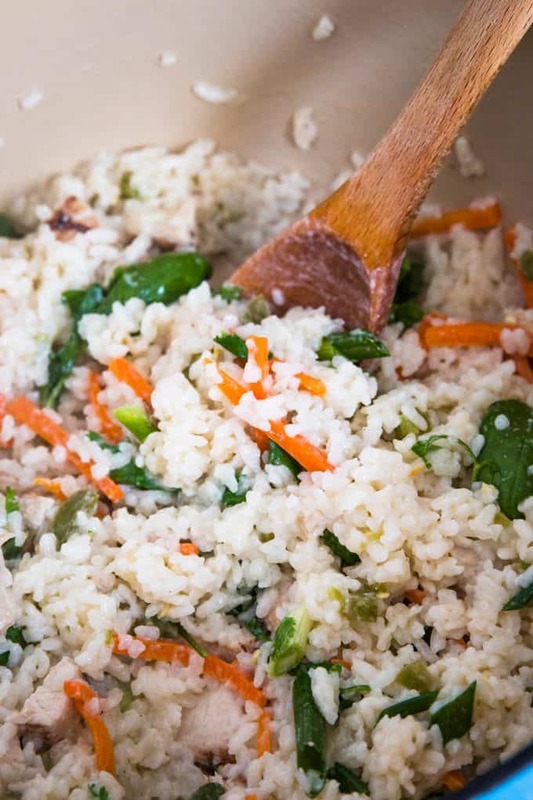 PLUS, adding cooked arborio rice to coconut milk creates a creamy mixture that reminds me of risotto – total win! 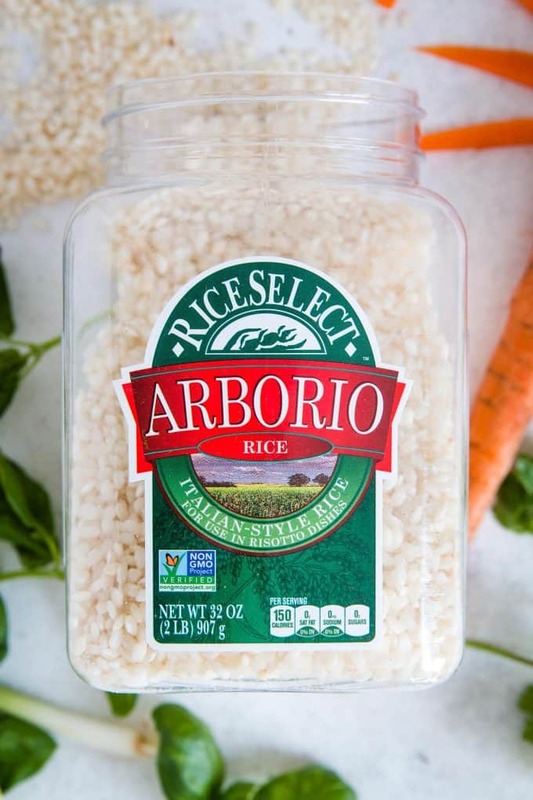 All of the RiceSelect products are packaged in clear, re-sealable, reusable, 100% recyclable BPA-free jars. Every jar is an invitation to inspiration! After you are finished chopping up your veggies (and while your rice is still cooking), add a little oil to a large pot. When its hot, add the carrots and jalapenos to the pot. Then add the coconut milk and bring it to a boil. Reduce the heat to simmer and then continue cooking the coconut milk mixture until the liquid has reduced by half. Add the cooked rice and any protein you might want to add and stir well. Turn off the heat and add the green onion, cilantro, and basil before you serve. Garnish with a lime wedge or two! Absolutely! For this version I used 2 cooked chicken breasts. Chicken and pork are a good meat option for this recipe. You could also add seafood like shrimp or crab! What kind of spicy peppers should I use? I used jalapenos because they are readily available. If you can find Thai peppers, I would suggest using one of those instead. They may be small but they pack some heat. If you’re looking for less heat, remove the jalapeno sides before dicing. If you are looking for more, add an additional hot pepper or a teaspoon of crushed red pepper. Begin cooking 2 cups of rice per the package directions - this will be equivalent to 3 cups, cooked. Cut your vegetables while the rice is cooking. Add sesame oil to a large pot over medium heat. Cook the oil until hot, then add the carrots and jalapenos. Cook for 1-2 minutes, then add the coconut milk, fish sauce, and the juice of 1 lime half. Stir well and bring to a boil. Reduce heat, then let simmer for 10 minutes. Add the cooked rice and stir to combine. Add green onions, basil, and cilantro, then serve hot. Optional: If adding cooked meat, add it at the same time as the cooked rice. 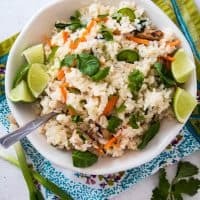 Absolutely loving the spice in this rice, it’s just bursting with flavor! Healthy means I can eat more, right? Looks delicious and so easy to make! ! Ohhh I bet this has so much flavor! 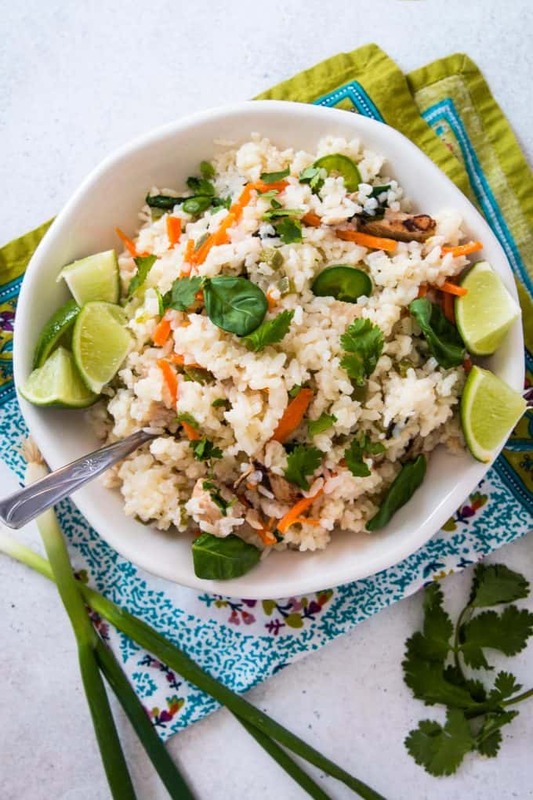 Love thai flavors in a dish! I do love to add a little spice to it as well! This looks so good! I didn’t know you could make anything other than risotto with arborio. I’ve got to try this!